I have 2 sisters, and I’m grateful for both of them. This post is about my sister Lisa. 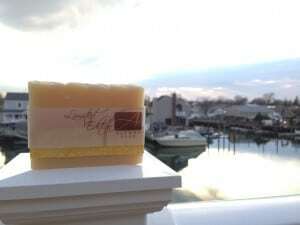 I’m grateful she takes pictures of my soaps for me. Whenever I ask her to, even if she doesn’t want to. This picture was taken in her friends back yard. The view is awesome and I’m sure she would rather be relaxing than snapping photos for me. I’m grateful she always remembers to send me a card on my birthday, even when I always forget to send her one. She is the thoughtful sister, I’m sure Pam will agree. I’m grateful she will stop by to help me wrap soaps whenever I need help. Which is often. I’m grateful she researches, plans and sets up out bi-monthly dinner club. She finds the best restaurants and we always have a great time. I’m grateful for all her help at my Open House and her advice. She has some good ideas and each year the Open House runs smoother.